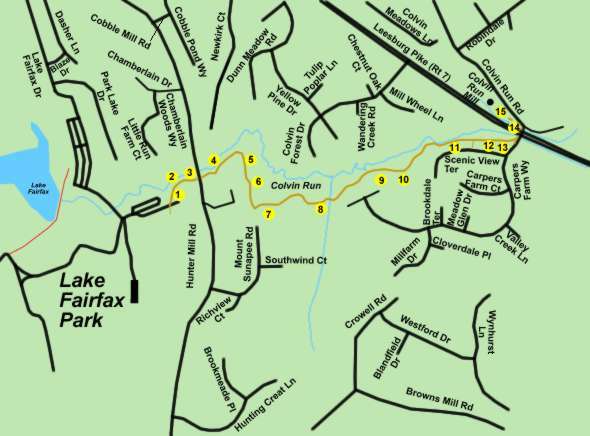 This walk follows a dirt trail utilized by horses, mountain bikes, and pedestrians between Lake Fairfax Park and Colvin Run Mill. This is not a loop walk and the mileage includes both directions of travel. The trail can become quite muddy after heavy rains or after a ground thaw in the winter. The trail is easy to follow. The walk starts in Lake Fairfax Park near picnic areas 1 and 2. The trail starts at an access road to the maintenance section of the park. Go north so that the maintenance area is on your right and the picnic area on your left. The trail curves and follows Colvin Run. Notice the horseshoe symbol on the trail markers. The trail crosses Hunter Mill Road at the single lane bridge over Colvin Run. The trail curves slightly as it follows Colvin Run on the other side of Hunter Mill Road. The trail turns right and goes up a hill. The view shows Colvin Run down the hill on the left side of the trail. Houses appear on the right as the hill is climbed. They are located on a private drive off of Hunter Mill Road. The trail to the right at the top of the hill goes to private property. After several turns the trail crosses a gully on a short bridge. The trail comes to a small stream crossing. Take a short trail to the left to avoid the mud prior to the bridge. The trail continues through the woods with homes on the right. Most of the homes are located on a private drive. The trail enters a meadow. After leaving the meadow the trail continues in a narrow section between Colvin Run and Scenic View Terrace. The stream crosses a small dam here and some of the water is diverted into a pipe leading to the pond next to Colvin Run Mill. The path crosses a mowed field before reaching Carpers Farm Way. After crossing Route 7 enter the grassy area next to the sign to walk to the mill. A flock of geese may greet you prior to the mill. Retrace your steps from here to return to the start of the walk.